The Victim's Choice For The Best Haunted Houses In America! YOU VOTE! We Display The Results. Find The Haunted House You Want To Vote For: Simply search for your favorite haunted house by selecting the state from the drop-down list to the left or search from our spooky haunted house U.S. map. Open The Haunted House Details: Once you have located your haunted house or haunted attraction, click on it to open the haunt's details. Locate the Skull Vote Button: On each haunted houses' details page, you will find a skull "vote" button. Click the Vote Button and Fill in the Form: Simply click the skull "vote" button and follow the instructions. Check Your E-mail and Click the Link Inside To Finalize the Vote! Visit More Haunted Houses and Keep Voting! If your favorite haunted house is not listed in our directory, tell us about it! Please note: all votes are cast by our web site visitors. We do not rate haunted houses or visit and review them; our web site visitors like YOU do! A rating of zero simply means that no one has voted for that house yet. Whether you are looking for a specific haunted house, or haunted houses across the U.S., HauntedHouseRatings.com is the site for you! All ratings are determined by YOUR votes. We do not rate haunted houses and we do not visit or review haunted houses; YOU DO! 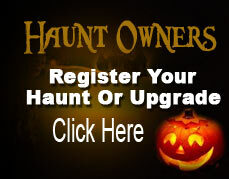 When you visit a haunted house, come back to this site and give it a rating! By clicking on the links in our haunted house directory, you'll go to the best haunted house web sites in the country - all voted for by haunted house lovers just like you. IIn our haunted house directory, you'll find the best local haunted houses across the US! You'll even find real haunted houses and ghost towns with real ghost stories in our haunted house directory!